The Health Benefits of Sunflower Lecithin include its effects on the body as a powerful antioxidant. It is non-genetically modified. It improves sports performance, supports heart and liver functions, boosts immunity and protects the brain. Lecithin is a group of lipids that are extracted from sunflower oil, which is then known as sunflower lecithin. Now-a-days, the demand for sunflower lecithin has been increasing because it is considered a non-Genetically Modified Organism (GMO) product, which is preferred by certain health-conscious consumers. It is a healthy alternative to soybean lecithin, which is a GMO product. In other words, unlike soybean lecithin, this type of lecithin is extracted through a natural procedure, without adding chemicals, that are otherwise harmful for human health. Sunflower lecithin is a collection of different phospholipids, and components of this lecithin are similar to that of soybean lecithin. It is a natural emulsifier that breaks down large fat particles into smaller particles and gives a smooth texture and appearance when added to the product. Sunflower lecithin contains high level of phosphatidylserine. This phospholipid possesses unique antioxidant properties. It reduces oxidative stress by suppressing the action of pro-oxidants and enhancing the activity of natural antioxidants. Lecithin scavenges the free radicals and throws them out of the body. Sunflower lecithin inhibits the oxidative stress and lowers the risk of diseases that are caused due to overload of free radicals and high level of oxidative stress. The major benefits of sunflower lecithin is that it is an abundant source of phosphatidylserine, which effectively combats exercise-induced stress and prevents damage caused due to overtraining. Use of sunflower lecithin by sportspersons speeds up recovery, prevents muscle soreness and improves overall well-being and health. Furthermore, phosphatidylserine suppresses cortisol, a stress hormone, which in turn protects the muscle membranes against damage. 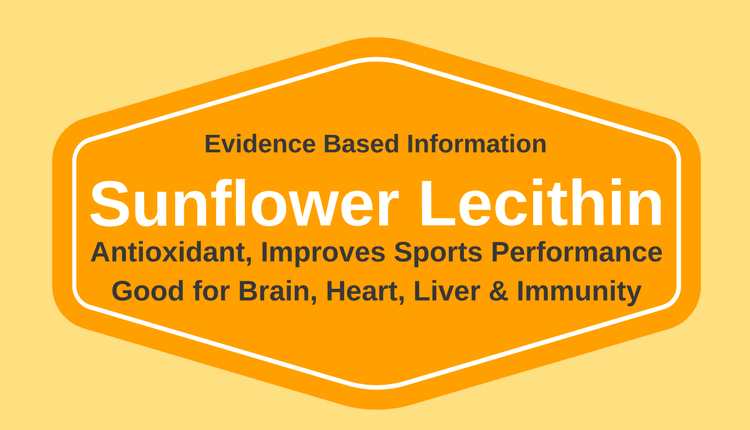 Sunflower lecithin protects the brain health. Phospholipids present in this lecithin are essential for the brain cells. They protect the brain cells against destruction and speed up the regeneration processes. Phospholipids present in sunflower lecithin benefit to prevent the accumulation of fat in the liver. Phosphatidylcholine, a phospholipid present in lecithin strengthens the liver cells, enhances the removal of toxins out of the body, that otherwise damage the liver cells. Phosphatidylserine present in sunflower lecithin possesses strong antioxidant properties. It protects the liver against attack by free radicals, scavenges them and inhibits oxidative stress. It further helps in the regeneration of liver cells and improves the structure as well as functioning of the liver. Certain compounds present in lecithin prevent hardening of the liver, and thus support optimum liver health. Having a strong immune system keeps diseases and illnesses at bay. Studies have found that phosphatidylserine, a phospholipid which is abundantly present in sunflower lecithin has a significant value in cancer and infectious disease therapeutics. It up-regulates the activity of immune cells that detoxify harmful foreign bodies and toxins, which otherwise increase the risk of infectious diseases. It promotes phagocytosis, a process in which cells of the immune system engulf micro-organisms and cut down the risk of infections. Besides this, phosphatidylserine possesses antioxidant properties. Various free radicals attack the healthy cells of the body. Due to increased free radical load the cells function poorly. This weakens the immune system and puts you at an increased risk of acquiring diseases. Phosphatidylserine blocks the action of free radicals, neutralizes them and protects the healthy cells against damage and destruction. Lecithin is an emulsifier, that causes breakdown of large fat particles and thus, prevents accumulation of fat in the body. This further prevents clogging of the articles, formation of the blood clots and blockage of the blood flow, which otherwise leads to heart diseases and weakening of the heart. The heart benefits of sunflower lecithin is that it also helps in reducing high levels of bad cholesterol, which further protects the heart against diseases and damage. Another mechanism by which lecithin may reduce the risk of heart disease is by lowering oxidative stress. Overload of free radicals may oxidise the LDL cholesterol to form oxidised LDL, which puts the heart at an increased risk of diseases. Phosphatidylserine, a phospholipid present in sunflower lecithin possesses powerful antioxidant properties that scavenge free radicals and inhibits oxidative stress.